Zegna Sport continues to offer cutting edge innovation, through the development of the Bluetooth iJACKET, a technological advancement of the acclaimed iJACKET or version 2.0 in tech geek speak. This new collection from Zegna Sport pioneers the new trend for â€˜communication clothingâ€™ â€“ by enabling the wearer to use the celj phone and simultaneously listen to music with an iPod, managing both through the sleeve control panel. The Bluetooth interface & integrated microphone on the jacket collar allow for voice dialing and phone conversations to be interchanged with music. As an incoming call is received the music volume drops to notify the wearer and the sleeve control panel switches functionality to phone control mode. 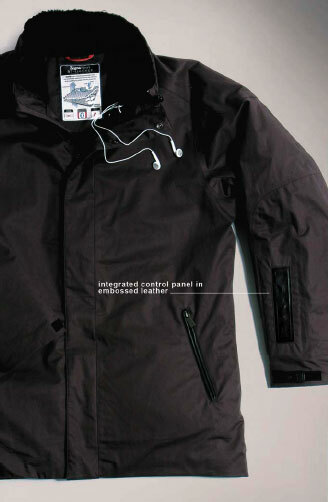 The BTiJacket uses the latest Wearable Electronic Technology from Eleksen to realize this high fashion items. Advanced functionality compined with Elektex soft electronic components design and textile switches. Zegna Sport â€˜upgradedâ€™ also the original iJACKET to a leather version, in luxurious soft brown or black Nappa in a washed vintage look, with the iPod control panel laser embossed on the sleeve. Â We are looking forward to a very fashionable high tech outfit in the coming autumn/winter collection 2007/08.